What organizations need to know about the new anti-spam law in Canada (CASL) coming into effect July 1, 2014. Canadians are tired of electronic spam. We've all been there at some point in time. You signed up for a mailing list for one company, and the next thing you know, you are getting emails from every related company on the planet. How do they get your email? What about those text messages that come through selling something? How did they get your phone number? This law is working towards putting a stop to annoying electronic SPAM. Almost every business owner in Canada sends some form of electronic message (email, text message, etc.) for marketing, customer communications, or contacting potential clients. Yes, when marketing our businesses and promoting our charitable organizations, we now have to be more responsible and aware of these laws. But this is not a bad thing. Build excellent content, ask people if they would like to receive useful and relevant information, and then continue to be a resource for your audience. This will build your credibility, support improved business relationships, and support long-term financial growth. An excerpt of some key points around Canada’s new anti-spam law is provided below. The answers to the questions is information taken directly from the official government websites with source links provided. I encourage using this as a point of reference and read further for more information. There is email subscription link on the fightspam.gc.ca to receive updates on the latest information released about this law. 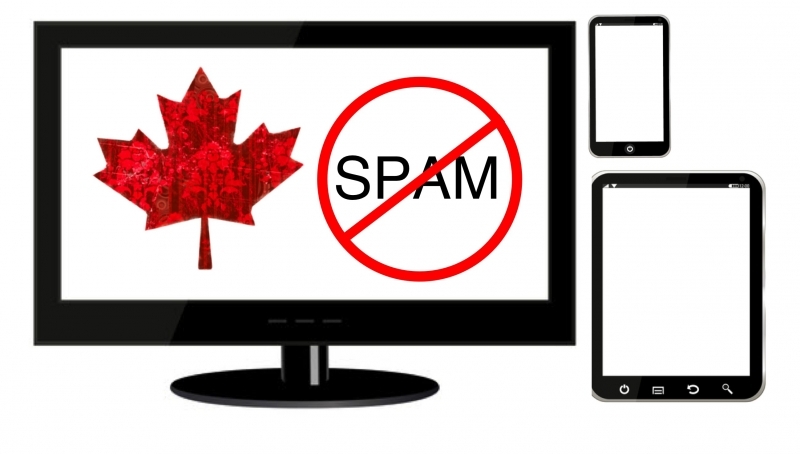 What is Canada's anti-spam law? Does this law apply me? How can I prepare for this law? The intent of the new law is to deter the most damaging and deceptive forms of spam from occurring in Canada. Spam includes more than unsolicited commercial messages. It has become the vehicle for a wide range of threats to online commerce affecting individuals, businesses and network providers. It can lead to the theft of personal data to rob bank and credit card accounts (identity theft); online fraud luring individuals to counterfeit websites (phishing); the collection of personal information through illicit access to computer systems (spyware); and false or misleading representations in the online marketplace. Businesses are victimized by the counterfeiting of business websites to defraud individuals and businesses (spoofing). Network providers—recognizing that spam represents 75 to 90 percent of all email traffic—are forced to invest ever-increasing resources to prevent spam from entering their networks. Once established, spam slows networks down, and spam-borne viruses and other malicious software (malware) are used to operate networks of "zombie" computers (botnets) without their owners' knowledge. These network attacks threaten the stability of the Internet and online services. 1. Determine if your electronic messages are commercial in nature. The law applies to commercial electronic messages (CEMs) only. A CEM is defined as encouraging participation in a business transaction or activity, regardless of whether there is an expectation of profit. Get the consent of your recipients, and keep records. The legislation requires obtaining "express" or "implied" consent. Express consent means that a person has clearly agreed to receive a CEM before it is sent - you cannot request consent in a CEM. Consent may also be implied in certain situations, for instance if there is an existing business or non-business relationship. In all cases, ensure you understand the consent you have received from your recipients, and keep detailed records in case you are ever asked to prove that consent has been received. Ensure that no part of the CEM is false or misleading, including the sender's identity, subject line, any Web links, or any other material part of the message's text or data. 3. Learn about the law at www.fightspam.gc.ca. The federal government has posted information about the law along with news, updates and valuable tips. You can even sign up for e-mail updates on topics such as the progress of the legislation and new information resources. Did the recipient say "yes" to receiving your CEM? Is the address published? Is there a statement saying they don't wish to be contacted? You need to track how you obtained consent of each individual to whom you send CEMs. Note: A message sent seeking consent to send CEMs is also considered a CEM.